Considering getting a Dogue De Bordeaux? 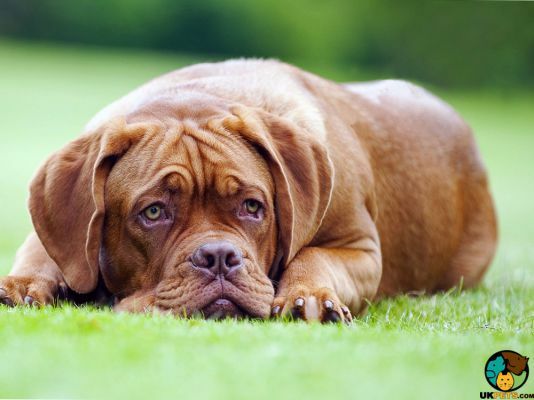 The Dogue De Bordeaux is an ancient breed that hails from France. Standing 58 to 69 centimetres and weighing 125 to 150 pounds, it is a giant breed with a serious and intimidating expression. However, it is a sweet and loyal breed that can be protective of its family but less aggressive than other guard dogs. 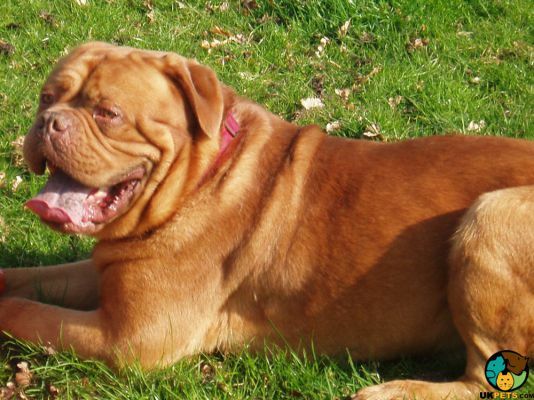 Are you thinking of getting a Dogue De Bordeaux? Here is a brief background of this intimidating yet sweet giant dog. 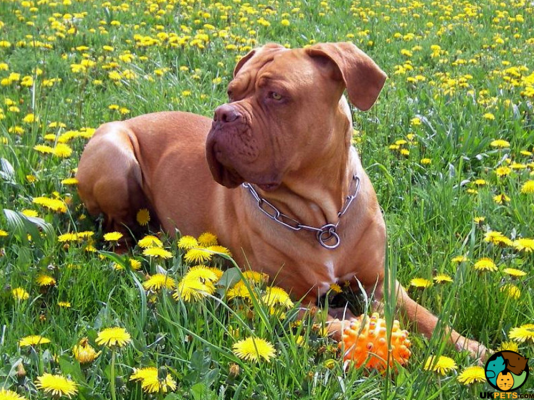 The Dogue De Bordeaux is one of the ancient breeds originating in France. There is much speculation when it comes to its ancestry but one theory is that it is a descendant of bulldogs and mastiff-type dogs that were crossed with local cattle dogs and hounds. Some say that the Bullmastiff and the Dogue were developed around the same time. 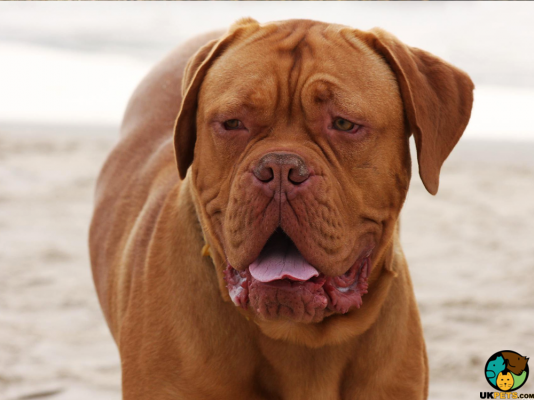 In 1863, the breed joined the first French dog show in Paris under the name Dogue De Bordeaux. The first breed standard was created in France in 1896. The Dogue almost became extinct between the two World Wars as it is said that Adolf Hitler did his best to eradicate the breed. In fact, after World War II, less than 10 breeding pairs were left worldwide. Breed enthusiasts started reviving the breed in the 1960s. From being a breed that had similarities with the Cane Corso, it learned to adapt as a family companion that got along with other animals. It was recognised by The Kennel Club in 1997 under the Working group and its numbers are growing. The Dogue De Bordeaux is a giant dog that stands 58 to 69 centimetres at the withers and weighs 125 to 150 pounds. It has a powerful and muscular look, and although it is heavy, it is quite athletic and agile when necessary. This massive dog has an exceptionally large head with short muzzles. Its skin around the face and neck is loose, which forms deep wrinkles. It has a moderately prominent forehead, small ears that are a bit darker than its coat, small oval eyes, and powerful undershot jaws. It has a serious, imposing and intimidating expression. The Dogue has a short, fine coat that is soft to the touch. It has a loose-fitting and thick skin without excessive wrinkles. It has self-coloured coats, which according to KC standards should be in all shades of fawn, from mahogany to Isabella. Chocolate is considered undesirable, so are white patches on the head or body. In addition, the breed can have any of the three masks: no mask, black mask and brown mask. Thanks its short coat, it does not have overly demanding grooming needs. It requires weekly brushing to keep shedding under control, as well as regular wiping of its facial wrinkles to avoid bacteria build-up, and its mouth because it drools a lot. Its ears need to be cleaned at least twice a month to avoid wax build-up. Completing its grooming routine are regular tooth brushing, nail trimming, as well as skin inspection for spots and ticks. The Dogue De Bordeaux may have an intimidating appearance because of its size and expression but it is actually a sweet family dog. It is loyal and gentle toward its family, friendly and warm to everyone it meets. It can be a naturally protective breed but it is less aggressive compared to other guard dogs. Early socialisation and training are needed for this dog to curb unwanted behavior. While it is gentle towards family members, this breed is not recommended for families with toddlers because of its giant size. However, interactions with older children still need supervision. The Dogue generally does well with other family pets especially those it grew up with. Its high prey drive will compel it to chase small pets it does not know. It is a better fit with experienced dog owners that can be the alpha in the household and consistently provide guidance so it won’t become wilful and uncontrollable. The Dogue is intelligent but it can have a stubborn streak. This means that while it can learn a lot of good things, it can also catch some bad habits. 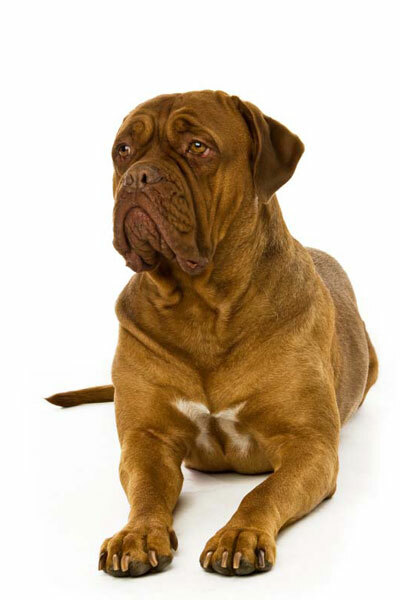 A typical serving for an adult Dogue De Bordeaux is 4 to 5 cups of excellent quality dry dog food per day. While feeding your dog, you have to remember that the amount of food depends on its age, size, build, activity level, and other factors. It can be challenging to feed a giant dog so to avoid over- or underfeeding it, ask your trusted vet for advice. Make sure you choose trusted brands and variants for giant-sized dogs designed to support the needs of Dogues. Stay away from food brands that are sold at mass retailers and grocery stores as they are cheap kinds containing by-products not suitable for human consumption and packed with artificial colourings and flavourings. Since large breeds are prone to bone and joint issues, their food should contain calcium, glucosamine and chondroitin. Highly digestible proteins are also important as this breed is also prone to digestive problems. Large and giant dogs tend to have a shorter life expectancy. 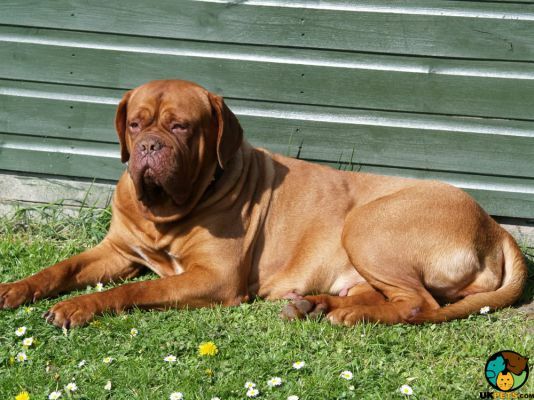 A well-cared for Dogue De Bordeaux can live up to 10 years. 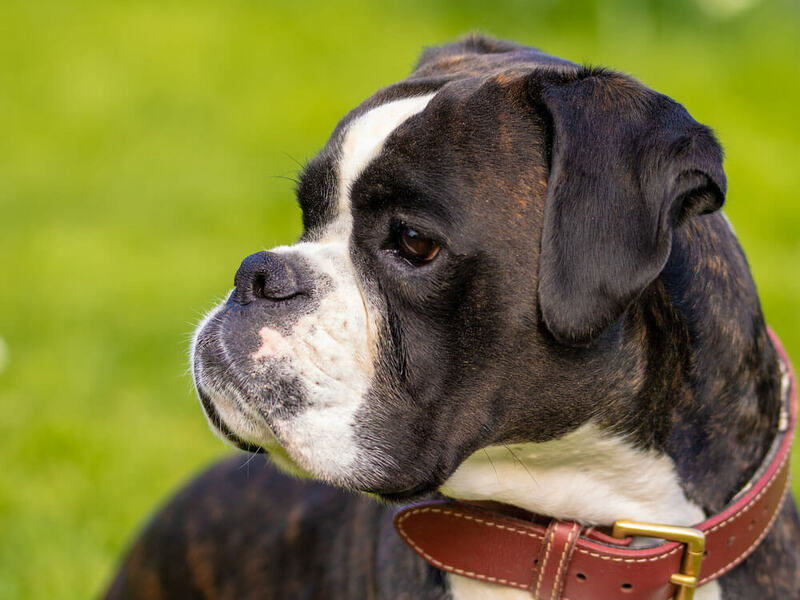 Some of the hereditary health problems the breed is known to suffer from are bloat, heart problems, skin issues, breathing problems, Hip and Elbow Dysplasia, and Hyperthyroidism. Dogues may be massive and would thrive on being busy but they do not have high exercise needs. At least an hour of exercise composed of a few walks and free time at a fenced yard will keep it happy and healthy. Considering its giant size and agility, make sure the fencing is secure and high enough or you will find yourself chasing after or looking for your Dogue because it has escaped. Taking care of a Dogue De Bordeaux is not cheap. First off, the price of buying a well-bred Dogue does not go lower than £700. Insuring this large dog costs around £80 to £180 for basic and a lifetime policy, respectively. It can even get more expensive if you choose a more comprehensive pet insurance premium. Since giant breeds have a bigger appetite and require more calories, the Dogue is more expensive to feed, costing about £80 a month. Annual veterinary costs comprising of routine check-ups, vaccinations and other basic treatments will set you back a minimum of £1,200. 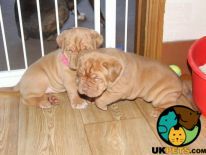 Basic equipment for your Dogue puppy to make it comfortable at home will initially cost around £300. Naturally, its things such as bed, collar and lease, food and water bowls, and toys will be bigger in size so they will also be more expensive. 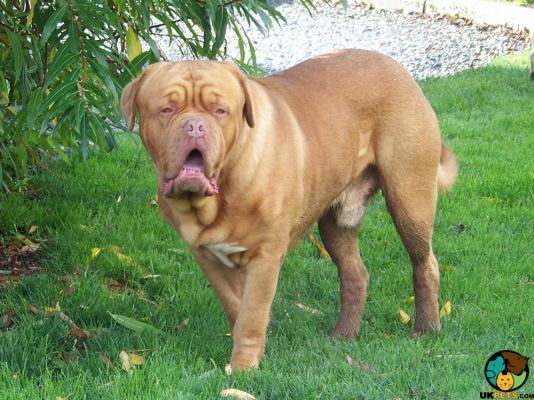 Is a Dogue De Bordeaux Right for You? The Dogue De Bordeaux is a giant dog that weighs 125 to 150 pounds and stands 58 to 69 centimetres at the withers. It has a short, fine coat that is easy to groom. The breed has an intimidating appearance but it is sweet, gentle and loyal. It is naturally protective to its family but it is less aggressive compared to other guard dogs. It needs at least 60 minutes of physical activities and mental stimulation.